We service all of Central Oklahoma including Edmond, Oklahoma City, Moore, Norman, Midwest City, Del City, Purcell, Blanchard, Newcastle, Mustang, Yukon. If you live in Oklahoma Cityand need a new lawn sprinkler system installed, or if you live in Norman and need a french drain or surface drain, or if you live in Mustang and your sprinkler system doesn’t work the way that your want it to, give CMG Sprinklers and Drains a call. French Drains can look nice! If you already have a sprinkler system, we can provide expert sprinkler repair if things are not running smoothly. CMG also installs Rain/Freeze Sensors. CMG Sprinklers and Drains also specializes in Drainage Solutions. If your sidewalk turns into a moat after a thunderstorm, or your backyard looks like pond, or even worse, If you have water leaking under your foundation into your home, we can provide a Drainage Solution. 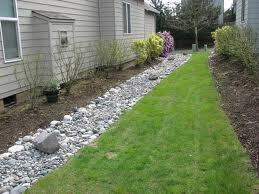 We utilize : French Drains, Surface Drains, Channel Drains, Basin Drains, Trench Drains, Basement Drains, and Sump Pumps. Sprinkler Installation, Drainage Systems, Sprinkler Repair, since 1993. If you are tired of dragging hoses around to make your yard look green. Consider a Lawn Sprinkler System by CMG. Our Sprinkler Systems are fully automatic and self draining. We install Rain Bird and Hunter Sprinkler Parts unless another brand is requested. 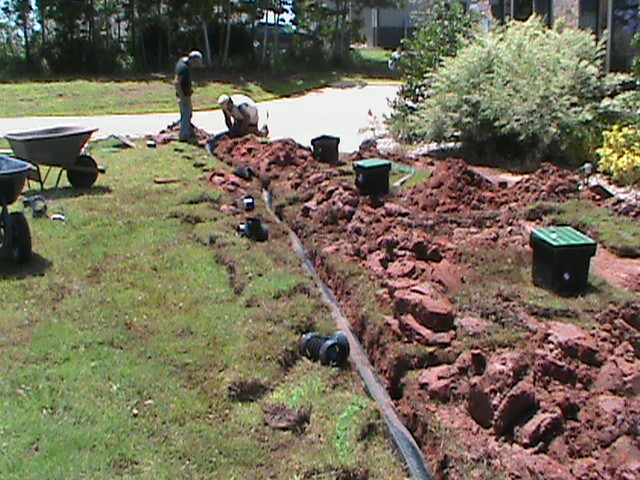 Drainage System Installation is another area thatCMG can provide Expert Service. We utilize many types of Drains to solve many types of Drainage Problems. CMG Drainage Systems may be simple using one type of Drain, or they may be complex interconnecting several types of drains. 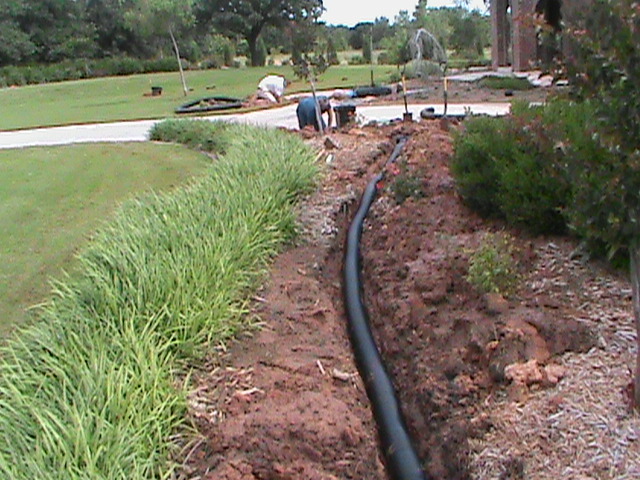 We install French Drains, Surface Drains, Channel Drains, Basement Drains, Trench Drains, Basin Drains, and Sup Pumps. 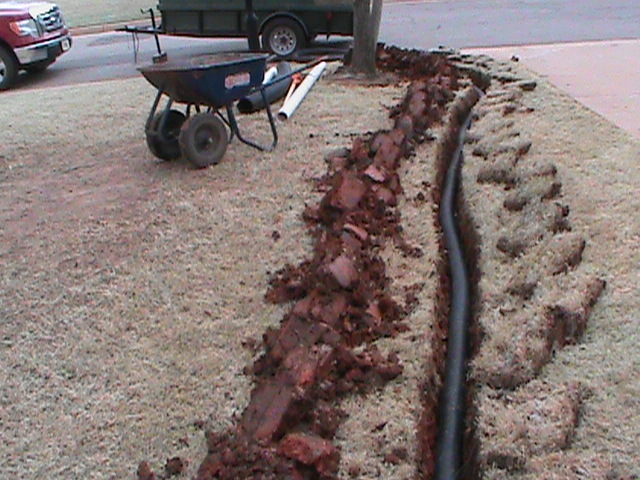 If you live in Purcell and need a Sprinkler Repair, or if you live in Edmond and would like a French Drain Installed, or if you live in Oklahoma City and would like a new Lawn Sprinkler System Installed. 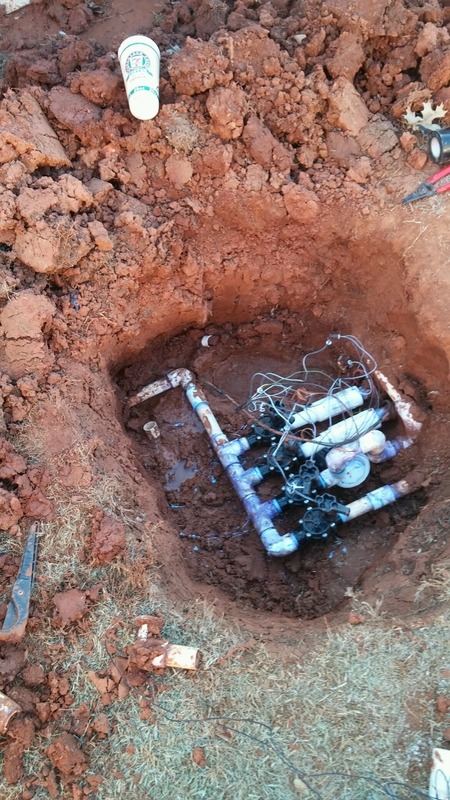 CMG completed another successful sprinkler system repair yesterday. A nice lady in south Oklahoma City turned on here sprinkler system and had a big leak in here front yard. 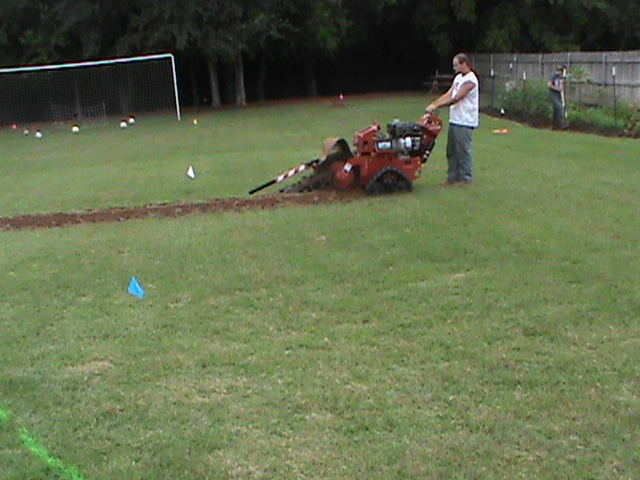 When we got there and got the area dug up, we discovered that the Sprinkler Pipe was not the problem. One of her had broken and needed to be replaced. Many times with Sprinkler Valvessprinkler repair, the problem is not what is initially first thought. CMG replaced her broken Sprinkler Valvewith a new Rain Bird DV 100 Sprinkler Valve. We did extra work but did not charge her more than was originally quoted. Servicing Central Oklahoma since 1993 including: Oklahoma City, Norman, Midwest City, Del City, Moore, Edmond, Yukon, Mustang, Purcell, Blanchard, Newcastle and all surrounding areas. Spring is here. Now is a good time to plan for a new Lawn Sprinkler System. CMG has installed top quality Lawn Sprinkler Systems since 1993. Our Sprinkler Systems are automatic and self draining requiring little to no maintenance. 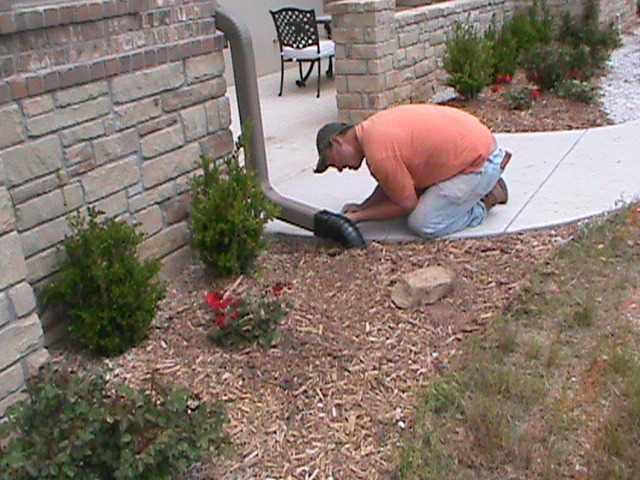 Sprinkler System Installation requires experience and attention to detail. CMG can install any sprinkler brand available, but we prefer Rain Bird or Hunter. Sprinkler Repair usually occurs in the Spring. CMG can help with: Broken Sprinkler Heads, Leaking or stuck sprinkler valves, broken Sprinkler Pipes, Sprinkler Controller/Clock problems, plus any other sprinkler system problem you might have. 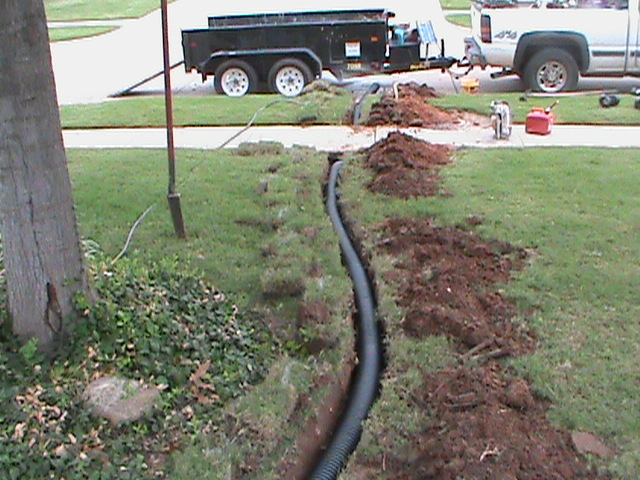 Drainage System Installation is a big part of our business in Central Oklahoma. We help people with Drainage Problems in and around their home or business. If your sidewalk turns into a moat after a hard rain, or if your back yard floods after a thunderstorm, give CMG a call. Standing water can damage cement and concrete in sidewalks, driveways, and foundations. We can quickly diagnose your Drainage Problems and design a drainage system to fit your needs. CMG utilizes: French Drains, Surface Drains, Channel Drains, Basin Drains, Basement Drains, Trench Drains, and Sump Pumps. We install a variety of drains to solve a variety of problems. CMG Sprinklers and Drains installs all types of Drainage Systems and French Drains. Since 1993 we have gained a lot of experience addressing drainage problems. Drainage problems can be complicated. The solution is not always clear to the untrained eye. CMG has repaired or overhauled many french drains and drainage systems that were installed by, “weekend warriors, a brother-in-law, or a landscaping company that also installs drains.” They all can install Drainage Systems, Just not very well. CMG has over 20 years of experience Diagnosing Drainage Problems. This ensures that a Drainage System that we install won’t have Drain Pipes that are too small, or Surface Drains installed where French Drains Should be placed, or Exit Points that allow water to Stand and become stagnant. The above examples are just three of many “Pit – Falls” that our experienced Drainage System Experts can easily avoid. CMG Can Help With Standing Water! Sprinkler Installation and Sprinkler Repair are areas of focus for CMG. If you are tired of dragging hoses around and would like a new Lawn Sprinkler System, give us a call. We have installed top quality Sprinkler Systems since 1993. Our Sprinkler Systems are self draining and require little to no maintenance. Just like your car or a home, sprinkler systems require repair or maintenance from time to time. CMG can provide expert Sprinkler System Repair. If you live in Central Oklahoma and have a Sprinkler System that needs help, We can provide the solution! Servicing Central Oklahoma including: Oklahoma City, Norman, Moore, Edmond, Midwest City, Del City, Yukon, Mustang, Purcell, Blanchard, and Newcastle. If you live in Oklahoma City and need a French Drain, or if you live in Norman and would like a new Sprinkler System, or if you live in Edmond and have a Broken Sprinkler Head. CMG Sprinklers and Drains — We have been in business since 1993. Servicing Central Oklahoma. 1. New Lawn Sprinkler Installation was our fist job in 1993. Since that time we have installed several thousand systems. We take great pride in the quality and workmanship that go into each system. CMG Sprinklers and Drains provides a 2 year warranty on Sprinkler System Installation. Our Sprinkler Systems are automatic and self draining. They need no maintenance to get them ready for winter. 2. Drainage Systems — If you have problems with standing water after a hard rain, or on your sidewalk or driveway, or even leaking into your home, give CMG a call. We can quickly diagnose your Drainage Problems and design aDrainage System to fit your needs. CMG Utilizes: French Drains, Surface Drains, Basement Drains, Channel Drains, Basin Drains, Trench Drains, and Sump Pumps. WE INSTALL A VARIETY OF DRAINS TO SOLVE A VARIETY OF PROBLEMS! 3. Sprinkler Repair for us goes “Hand-in-Hand” with our Lawn Sprinkler Installation. CMG can provide expertSprinkler Repair for many Sprinkler Problems Including: Broken Sprinkler Heads, Leaking Sprinkler Pipes, Sticking Sprinkler Valves, Backflow-Valves, and Sprinkler Controller issues. 4. CMG also installsRain/Freeze Sensors for New and Existing Sprinkler Systems. Rain/Freeze Sensors Turn off your Sprinkler System when it is raining or is too cold to water and no one is available to turn off the Sprinkler System. It will turn your Sprinkler System back on again when it warms up or dries out enough to water. Servicing Central Oklahoma including: Norman, Moore, Edmond, Del City, Purcell, Blanchard, Midwest City, Newcastle, Mustang, Yukon, or Oklahoma City. Winter is coming to an end. Heavy rain and snow seem to be more common for Central Oklahoma. Unfortunately the slopes and grades around our homes and businesses are not always designed to handle lots of heavy rain and snow. Standing Water and Storm Water-Runoff can cause damage to our homes and businesses. Protecting your interests can be accomplished with aDrainage System. CMG Sprinklers and Drains has been solving Drainage Problems since 1993. If you live inCentral Oklahoma an Estimate from CMG is free. We can diagnose yourDrainage Problem and design a Drainage System that will fit your needs. Many timesDrainage Problems are somewhat unique. CertainDrainage Solutions can require more than one type of drain. 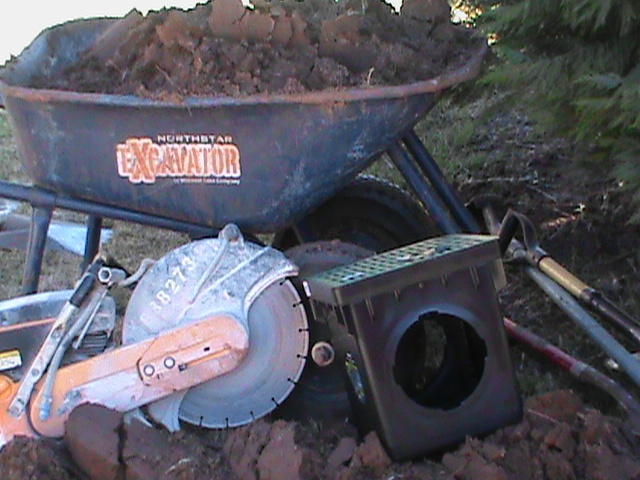 Some Drainage Systems require several types of Drains to solve a specific problem. Other situations require just one type of Drain and are much more straight-forward. CMG Sprinklers and Drains utilizes: French Drains, Surface Drains, Channel Drains, Basin Drains, Trench Drains, Basement Drains, and Sump Pumps. THIS ALLOWS US TO INSTALL THE BEST TYPE OF DRAIN TO SOLVE THE PROBLEM. If you already own aSprinkler System or are considering Installing a Sprinkler System, you should consider a Rain/Freeze Sensor. It will turn off your Sprinkler System if it is raining or gets too cold and no-one is around to turn it off. The Rain/Freeze Sensor will also turn it back on again when things dry out or warm up. If you live in Yukon and need a French Drain, or if you live inNorman and want to Install a New Lawn Sprinkler System, or if you live in Blanchard and need aSprinkler Repair, Give CMG a call! CMG Services Central Oklahoma including: Oklahoma City, Norman, Moore, Edmond, Midwest City, Del City, Blanchard, Purcell, Mustang, and Yukon. Please leave a comment or send feedback in an email about our website.